When business leaders used to speak of reaching for the sky, it was taken as a metaphor for setting high business goals. But now, whether your firm is in retail, construction, security or sports, the skies may be a genuine source of commercial advantage. Rapidly improving technology and lower costs mean civilian and commercial drones – or unmanned aerial vehicles (UAVs) – are hovering on the very edge of the mainstream. 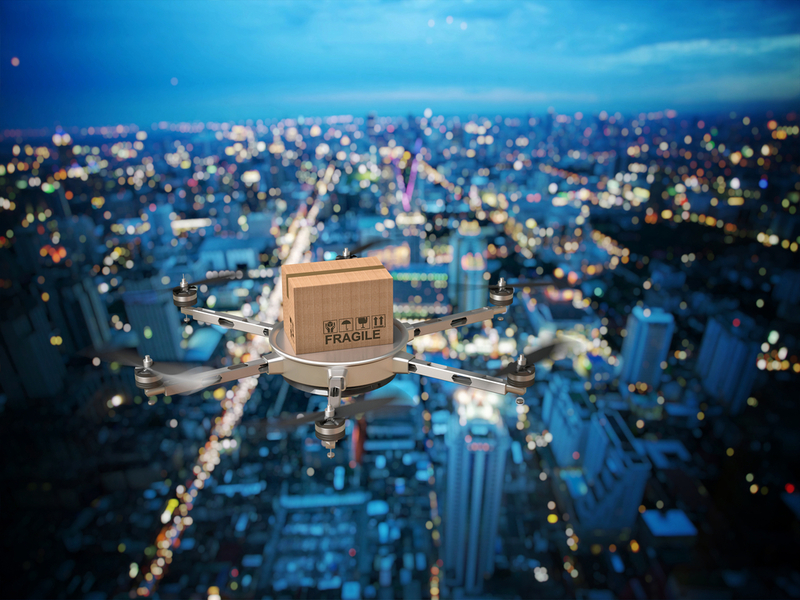 As reaction to Jeremy Clarkson’s new advert with Amazon has proven, the concept of deliveries flying through the skies to our homes seems to thrill and appall in equal measure. Drones are already being used commercially on a scale that may surprise the public. Devon and Cornwall Police has trialled the use of drones to monitor traffic accidents, search for missing people and to record crime scenes. Additionally, UAV’s are being used in farming to gather data on mass, which is a real area of growth in the industry. This is just the tip of the iceberg. From archaeologists getting a quick and easy overview of an excavation site to wildlife rangers monitoring for poachers, the potential is endless. We are also seeing a significant increase in the use of drones in quarrying and mining. In Europe one can expect to see more trials of drones in rural areas. As legislators decide how to ensure UAVs use is as safe as possible, it’s natural to test the waters (or skies) in sparsely populated areas. It may not just be hawks you spot on your next trip to the country. Both Australia and the US have seen drones used to deliver medical equipment to remote areas in the past year. As drone battery life and Sense-and-Avoid capabilities rapidly improve, such procedures will become more frequent. But I also expect 2016 to see more UAVs deployed in response to disasters or emergency situations. The potential of drones to help emergency services is almost limitless. From providing a critical overview of a disaster area to delivering blood supplies to carrying infrared thermal imaging cameras to help locate earthquake victims, drones can help save lives. And whilst drones may also pose their own security risks (see prediction four), it’s likely police and security services will expand on their current limited use to help in everything from event security to monitoring illegal activity. Just as the planes that fill the sky above us navigate along designated air traffic corridors, so will the skies have to be plotted and shaped for the mushrooming use of commercial drones. The European Aviation Safety Agency (EASA) is already taking on this task and in 2015 it started looking at proposals for how best to open European civil airspace up to UAVs. When it comes to ‘drone aircraft corridors’, Europe has been far more progressive than the United States. The USA’s Federal Aviation Authority (FAA) has been viewed by some as more conservative in its reaction to the commercial drones. So much so that Newsweek reported earlier this year that Amazon has opened a research centre in England to develop its delivery service as Europe is more ‘forward-leaning’ in its approach to drone regulations. Increasing use of drones by European security and emergency services mean that the formalization of drone corridors are a case of ‘when and how’, rather than ‘if’. Expect major progress in 2016. Five years ago the FAA predicted that come 2020 there would be approximately 15,000 drones in the US. That’s actually less than how many are sold each month in the States. The spurt has caught legislators on the back foot and there’s no question that drone use must be carefully regulated. As with all new technology (think driverless cars) public opinion is a mixture of awe, fear, excitement and suspicion and the use of drones by criminals, paparazzi and terrorists are obvious public concerns. High profile incidents of drones crashing on the White House Lawn or being used in an attack on the Japanese Prime Minister’s office will mean caution remains the guiding principle. And while it’s vital the issue generates considered and calculated legislative debate, the obvious benefits drones can bring society should add an extra urgency to the discussion. Whilst 2016 should see progress made in relation to drone corridors, overall there’s unfortunately unlikely to be major strides made in the overall regulation of drones. So while the skies won’t be buzzing with drones quite yet, there will certainly be more of a buzz on the ground about them than ever before.